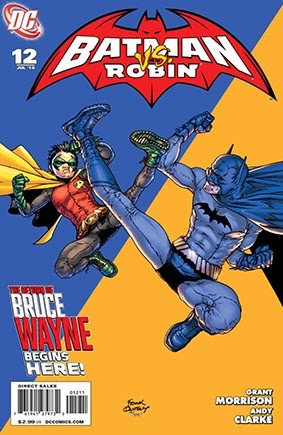 • PLOT SUMMARY: Batman Return of Bruce Wayne: Prelude - All is revealed in this final installment of 'Batman vs. Robin' - the identity of the Domino Killer, the terrifying secret of the dominoes, and the shocking truth behind El Penitente! All of this, plus the surprising return of a fanfavorite character! Written by GRANT MORRISON. Art by ANDY CLARKE & SCOTT HANNA (12 pages) and DUSTIN NGUYEN & HANNA (12 pages). Cover by Frank Quitely.